If you daydream of falling asleep in a tent within a stone's throw of the African savannah and all its glorious wildlife, you might want to look into Kenya camping tours. In particular, these top African adventures will give you a trip of a lifetime. Ranked the number one African safari by Fodors Top Ten African Safaris for 2018-2019, &Beyond provides a unique escape into Africa's wildlife paradise, including Kenya camping tours. Their trips can focus on different themes and objectives such as educational, conservation, and sustainability themes or their "luxury in the bush" experiences. These luxury packages sometimes include therapeutic themes such as yoga safaris. For the adventurous, you can sometimes participate in helping shoot darts into rhinos (not kidding) for conservation efforts. You can also do walking safaris or go on turtle-hatching expeditions. For the Kenya expeditions, the cost ranges from $330 to $480 per person per night or $1,505 for a family tent per night. For about $386 a night per person, Kilima Camp offers an immersive camping experience with tours available as a part of your stay. Rated by Trip Advisor as one of the very best camping tours in Africa that focus on Kenya, Kilima Camp is noted by reviewers for being especially good for families and having knowledgeable game drivers who know the local birds, trees, and animals in great detail. Guides will also take you on a Maasai bush walk where you learn about Maasai culture. Chalo Africa ranks the Great Migration Photo Safari with Hilary Hann as the top Kenya camping tour. For about $7,950 for an 8-night trip, you can see Kenya grasslands and wildlife through the eyes of award-winning wildlife photographer Hilary Hann, who helps lead expeditions. Another renowned guide will also be there with you. Named one of Conde Nast's Top 25 Guides of Africa (yes, the entire continent), Johnson Ping'ua Ole Nkukuu, aka "Ping," has an uncanny instinct for predicting animal behavior and getting you in the perfect spot at the perfect time to see breathtaking scenes unfold from Africa's Great Migration. Another top-ranked Chalo Africa pick, this camping tour is rated one of the top three safari camping experiences money can buy. With Walking in the Mara, you get a tour that features luxury tent camps for about $3,200 per person for a six-day journey. It features superb quality game drives, night drives, and a walking safari to give you every opportunity to take in the wildlife from the biggest animals to the smallest insects and plants. Tour Radar rates Kenya Wildlife Safari as the top Kenya camping tour. It costs about $1,084 per person for an 8-day journey. It's family friendly (suitable for ages 15 to 99), and you can stay in a luxury tent or a more rustic traditional "homestay." 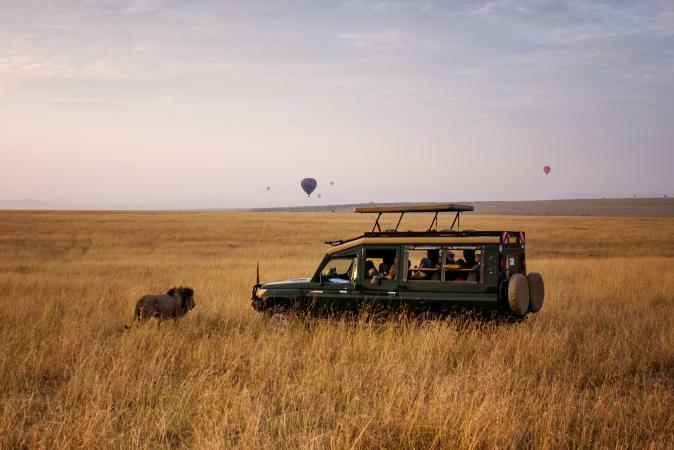 As far as wildlife goes, you can choose to tour Masai Mara, the Serengeti National Reserves, the Big 5, an elephant orphanage, or a chimpanzee sanctuary. Another Top 10 Safari selection by Fodors, African Serendipity (ranked the second best Kenya-focused tour) is a New York-based safari company that focuses its resources almost exclusively on Kenya camping tours. It specializes in creating custom trips with each client. The trips start at about $6,100 for 12 to 14 days, and each trip can end with a day at one of Africa's gorgeous beaches, an unusual feature for a Kenya camping tour. Rhino Africa Safaris, rated 5 out of 5 stars by Trust Pilot, is named by Consumer Affairs as one of the best camping tours in Kenya. It features two safaris designed for first-time visitors, giving travelers a quick but unforgettable impression of Kenya's highlights. The company offers a price guarantee: if you find the same vacation for less, they'll match the price. Their prices change frequently so you must contact them to get a quote, but for a "people sharing" package, their specials show a cost of several thousand dollars for 11 to 14 nights on average. Regardless, if you find a cheaper price somewhere else, they will match it. Fodors names Abercombie & Kent (A&K) one of the top 10 safari camping tours. A&K has been around since the early '60s. They specialize in offering customized adventures with private guides. The details of your trip are personalized and planned meticulously. It's possibly the closest thing to experiencing what Teddy Roosevelt and other famous adventurers experienced when they had private guides plan every step of their camping safaris in Kenya. A 12-day trip costs about $5,995.